Available in a range of attractive colors to match your decor, this elegant three-piece bed set features a charming modern pin-tuck design for a lovely hint of texture in your style. The soft fabric is machine washable for easy cleaning. Dimensions 16.0 In. X 16.0 In. X 9.0 In. My wife and I purchased this item roughly 6 months ago. We have washed the comforter twice and on the second wash, the seams ripped and now we have two 10 inch tears in the comforter, exposing the cotton interior. Furthermore, Overstock did not offer any type of reimbursement, future coupon, or return. It's almost as if they do not want the repeat business. I love this comforter. I got the coral color and was worried it wouldn't match my room but the color was exactly like the picture. It is also extremely soft and keeps me warm at night but I don't get sweaty. This comfortable and soft comforter is the perfect shade of blue. It is so soft, and warm enough, but not too warm is perfect for all seasons. The price point was exactly what I was looking for. Although it fit within my budget, it has a very luxurious feel, holds its shape. I feel like it is a little shorter then I would have liked. However, I don't use a bed skirt on my bed because of the style of my bed. With that said, I would order this product again, changing only the size I ordered. I have a queen size bed, and ordered a queen size comforter. Next time I will order the King size. I love this comforter! It's very warm but very light! I got this in white about one year ago. This comforter stands up well to washing! Out of the package, you’ll see it’s very soft! Usually I pair a blanket under a comforter for warmth but this keeps heat in fine on its on. The pintucks give the look some texture and the shams look really nice next to a pillow case with some color. It’s a good buy. So soft and inviting! ! I am very pleased with the color of this comforter set!! It is the most perfect shade of sea/mint blue to compliment my new spa guestroom! ! 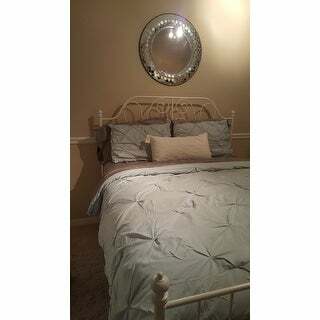 It is a very light weight comforter and does seem to run a bit fitter to size, if you are looking for that cushiony oversized look order up a size! The king looks so inviting on my queen size bed! Not a 100 % sure that this would be the best choice for everyday use as it does have a somewhat delicate look to the fabric and batting. 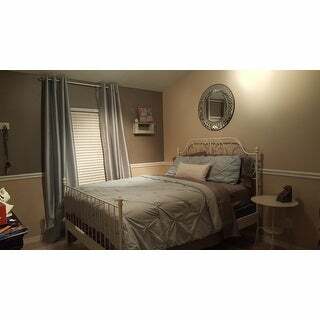 No question that it is worth the price for a guestroom! !! I ordered my pintuck light blue comforter &amp; pillow shams online. It was as lovely as it looked online. Ample size for my king size bed. I absolutely love it. I recommend this to anyone wanting an elegent classy look! This comforter looks and feels great. I've had it now long enough to have washed it and it comes out very well. I few tucks came undone but that was easily fixed with a needle and thread. For the price it's well worth it! Perfect soft color & feel. Adds a calming retreat feel to the bedroom. This is beautiful. Thick and soft, color is pretty true to what you see onscreen. Good purchase. Surprised my daughter with mini room makeover. It is light and feels good to the touch. Ordered misty blue. Love the color. Great for the look I was trying to achieve . 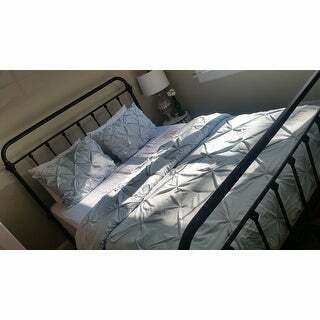 I bought this comforter in the gray I was looking for something gray with no print I spotted this one read the reviews and decided to buy it. I'm so glad I did I love it my family has come by and they love it too. After reading previous reviews, I ordered this in a King size for my Queen size bed & it fits perfectly. It's soft & the color was exactly what I wanted. Beautiful. Looks just like the picture in color and look of comforter on bed. Very happy! Purchased this comforter for our guest bedroom. The color is as-pictured. It is a nice weight and quite comfortable. However the pintuck style is difficult to keep from looking wrinkly. THE QUALITY OF THE COMFORTER IS VERY GOOD! IT LOOKS LIKE A MUCH MORE EXPENSIVE SET THEN IT WAS. LOOKS GOOD, FEELS GOOD, COULDN'T ASK FOR MORE! The comforter is so soft, love the matching pillow cases. Super pretty was perfect for our daughter! "Does the fabric feel like microfiber?" I would say the hand of the fabric is reminiscent of microfiber but doesn't exactly have the texture of legitimate microfiber. It is a very soft comforter and has held up well for the 6 months I've had it. Not quite as soft as microfiber but still comfy! It is super soft although I wouldn't describe it as microfiber either. It feels like super soft brushed cotton. Love the feeling of it. "Is the misty blue more of an aqua shade? It looks like it on my computer re: the picture, but I know how that works. Isn't always as it appears." It is more of a green/blue---exactly as pictured. I would agree, it looks just like it is pictured. A beautiful misty blue. "What color exactly is the indigo. Indigo normally is a dark blue. I'm looking for one that is more along the lines of aqua." "Does the grey color come in Full size? It's not showing up and I want to order it. " This is currently out of stock, but is expected to be back in stock in mid-September. "what are the size difference between a twin and full size comforter? what size would be best for a single bed?" "I am interested i ordering the "coral" one... I like the color is shows ups on the screem like a rose/blush pink. Is is the color shown or is it true coral like orangey?"